One of the most exciting things happening at Lithia Chrysler Dodge Jeep Ram of Portland is the pending arrival of our new mid-sized pickup, the Jeep Gladiator. It's due to arrive at our lot in Spring 2019, and we can't wait to introduce it to all of our customers. If you want to be one of the first to give it a test run, contact one of our sales team today. At first glance, you will know the Gladiator definitely comes from Jeep. It offers strong styling from front to back, starting with the iconic seven-slot grille the brand is known for. Large, rugged tires sit under fender flares for industry-leading off-roading capability. The cabin opens up to the air with a removable top and fold-down windshield. 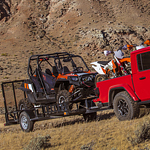 The all-new Jeep Gladiator comes with Best In-Class towing capable of pulling 7650 pounds and Best In-Class capable of hauling a payload of 1600 pounds. What more do you want in a Jeep truck?